Are you prospering and don't know it? That was a serious question. Many of us serve the Lord "with all our hearts" and yet we feel that God's promises are not being fulfilled in our lives. We don't feel we are "prospering". Is it possible that He is indeed prospering us and we aren't noticing it because we aren't seeing the truth? Perhaps it's time to prayerfully take another look at our lives as they really are. As you think on this you might say, He isn't prospering me, I live paycheck to paycheck. He isn't prospering me, I can't buy the car I want, live in the house I want, wear the clothes I want and travel where I want to go. I'm not a prosperous person. Pray and ask the Holy Spirit of God to enlighten you as to your true situation. One aspect that comes to mind is that we are making these judgments in the perspective of living in America today. So many people are so wealthy and we see this on TV and in the movies all the time. It skews our perspective and tempts our flesh. Could we be errantly comparing our "prosperity" to those people rather than the majority of the world? If we had somewhere inside to sleep last night, if we did't go to bed hungry, we are indeed prospering. We may not live on the level of prosperity that our flesh longs for, but we are prospering beyond most of the world. Prosperity also has more levels than just financially and lifestyle. There is a much more important aspect to our lives, the spiritual part, our relationship with our Creator. Ignoring the "prosperity message" so prevalent in Christianity today, if we actually read God's Word, the vast majority of His addressing the subject of earthly riches and power is in a negative way. These are things He warns will make it exceedingly difficult for us to enter heaven. They come with inate spiritual issues that HINDER our Christian walk with Him, which is the most important part of our lives. Riches, fame and power are NOT things He has held up as goals we should pursue or value, but rather a humble and sincere life of service to Him and pursuing the development of godly and righteous character in us, the bearing of good fruit is to be our life's goal. Bearing this truth in mind, it would seem that a loving God who has promised not to allow more to tempt us than we can bear with His help, would not bestow these things on many people because He wants us to make it to heaven above all else. It seems to me that the very absence of earthly "prosperity" might be a great testiment to God's fulfilling His promise to us to prosper us. He is beckoning us to seek Him with all our hearts like King Hezekiah did so that He can truly prosper us - spiritually. That's the prosperity that will last eternally. And let's not forget to give Him thanks for prospering us in other ways too. Don't take what you have for granted simply because you want more. If we don't even thank Him for what He has already given us, why should He give us more? Seriously! How sad it would be to live our lives feeling let down by God, only to reach the judgment day and be shown how abundantly He had blessed us, but we turned a blind eye to it all! 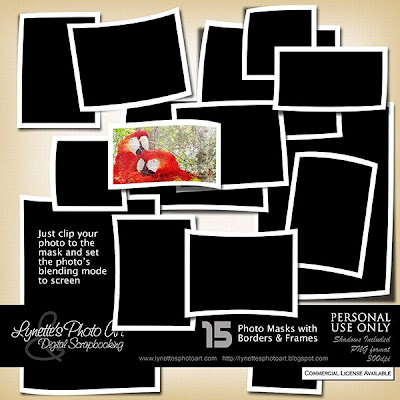 Photo Masks 1 is a collection of 15 warped photo frames with shadows and white borders. Just clip your photo to them and set the photo's blending mode to screen - voila! Use them is your own designs or use them with templates that don't offer this level of dimension. $2.99 in my PayPal store. Click image to enlarge. Click Buy It Now button below preview to purchase. I'm giving one one of the frames today to sample the kit - enjoy! I love your comments, so please leave one at the bottom of this post as I have disabled 4shared comments. This helps me to know what you like for the future and please support this blog by shopping my PayPal store. God bless you!